Time marches on and I find the days go well as long as I keep busy. The election this week set me off on a cycle of late nights once again, and sleep eludes me until I can no longer hold my eyelids open. But, while I await the sandman’s arrival, I see Keith’s smile in the photo across from me, a little smirk that made dimples in his cheeks, a twinkle in his eyes that spoke a bit of mischief, a challenge. Of course these were mostly photos taken by others. For when I was the photographer, Keith would often challenge me with a bit more rebellion, and sometimes a crude gesture, all in fun. Or, I would have to work a bit harder to capture those moments when he had his guard down, was a bit more contemplative, unaffected by the camera. It made my role as family photographer a little more challenging, working around the self-consciousness that was sometimes awkwardly expressed. My role as photographer shifted a little when we traveled, even more so when I traveled alone. As much as Keith traveled in the South Pacific – living in Fiji, working on the dive boat, or flying to Tonga or Vanuatu – he was still much more of a homebody. When we moved back stateside to Michigan, he would be willing to drive long distances, though often complained of pain in his shoulders from doing so. But as weird as it may sound from a guy who had his pilot’s license, he hated flying commercially. Can’t say as I blamed him. If I could avoid it, I would. But I had yet to find a way to beam myself to a conference destination. More than a few times Keith and the kids would join me when I went to a conference, or we would join Keith for one of his symposium destinations. It was great fun, though a little stressful at times. And I admit a little envy for having to miss out on the family fun while I sat inside at a conference event. Still, we managed to work in some quality time together when we drove to these places, using it as an opportunity to “see America”. But during the times when either of us would travel alone, we would always come back with pictures to share with the other. In my case, I was fairly prolific looking at these photos as an opportunity to add to my photo library of memories and resources for future art projects. When Keith’s diagnosis was nearly confirmed in early June this year, we sat down on the big leather sofa in the living room and, page by page, photo by photo, we revisited our lives together. It was during those early reminiscences that Keith expressed for the first time his thoughts about his life. The odds were not good, he knew that. Yet he was not giving up. But he was coming to terms with the reality of his foreshortened future. So, as he looked back through those albums filled with the iconic images that defined our lives, I heard him say it. “I have no regrets. I have no regrets for how I have lived my life.” That didn’t negate that he was deeply saddened, depressed, or even angry at times about this turn of events. But it became the anthem upon which the rest of the family would rally. No regrets. Seqa ni rarawa. We had often talked about certain travels we wanted to do together. St. Petersburg, Russia was one of those places we had agreed would be a place we wanted to see. When the possibility came about, and an invitation for a Fulbright to Ekaterinburg, Russia came in September 2011, my mouth dropped. Here was our chance to do this. But it soon became clear that there would be too many obstacles to overcome to have us both travel at this time. Keith’s work making custom furniture was growing, and he had several shows the following May (2012) and too many other things to prepare for. Besides, spending three weeks in Ekaterinburg while I was teaching, before heading to St. Petersburg, just seemed too daunting for Keith to overcome. So the plan evolved to where I would go alone, become acquainted with travel in Russia, even visit St. Petersburg on my own, and then in the future, we would go back there together. I never made it to St. Petersburg, canceling that part of the trip when Keith’s illness turned into something more ominous than the flu we thought he couldn’t shake. But this summer I continued to take photos often to share with Keith the progress on Perry Road, or to show him something I needed to ask him about, or a special moment that I wanted to share with him. The photos continued to be part of the archive of our lives together. But as the summer faded, and the progression of Keith’s cancer moved relentlessly towards its ultimate end, I began to question myself. 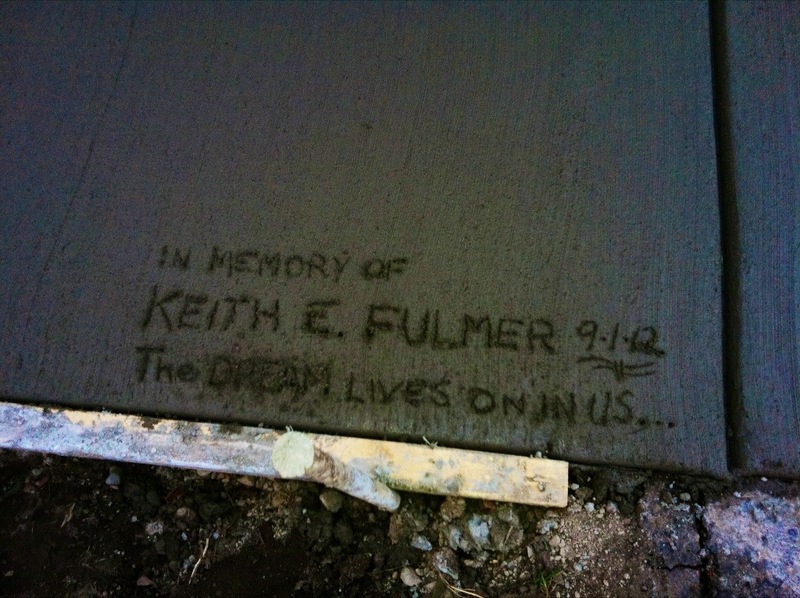 Eleven days before Keith passed away, I contemplated this issue in my diary. Who will the photos be for now? Over the years, when Keith was unable (or unwilling) to travel, especially if the flights were long, I would take many photos to share with him. Before, they were film-based and thus I would get them hurriedly developed and printed upon my return. More recently, I used a blog and photos – with their basic descriptions – uploaded for him to see almost in real time. I wonder, though, how much energy he had to look when I kept a blog up with photos on my recent Fulbright to Russia. Now I wonder as I travel … who are the photos really for? My guess….the child yet unborn. Why do I continue to take photos of the Perry Road project’s progress? Is it just to document a process of renovation? Who are they for? Are they to fulfill some personal need to continue to chronicle what was begun before Keith died? Do I continue to photograph it and the nature around it out of some sort of habit I cannot break? That is what led me to write that question in my diary. Who are the photos for? What purpose do they serve? Icons of life, artifacts of an experience, an effort to freeze time, or hold a moment completely still for perpetuity. Do they sadden me when I see them? Sometimes. For when I look at them, I can feel myself being transported to that moment, or an illusive memory of that moment in time, seen from the context of decades past. They are the stories that should continue to be told to the next generation. They are part of my personal history, my own story, Keith’s stories. They speak volumes, without the details of a formal narrative. And since Keith is not here to tell his stories, then they will have to speak more for him, too. They will be part of a family’s history, told around the campfires of future cool autumn nights. …the photos all fit on the shelf down in the basement. Albums representing an entire family’s history fit under the coffee table. A few select photos, framed, hang on the walls, icons of a family life. How do these tell our story? Is it how we wish to build our history? who will retell it to the next generation? or will the stories be lost? The photos, all boxed up and mostly labeled, fit on a shelf in the basement, to become archaeological relics of a lifetime gone by. How will the new story be told? What new roads will we travel? and who will travel them? Who will join us? and who will leave us? What life shall I build now? 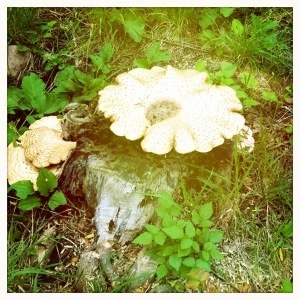 Photo below: Large fungi grow off an old tree stump behind the workshop at Perry Road. I felt like Alice coming across this giant, waiting for a pipe-smoking caterpiller to show up.